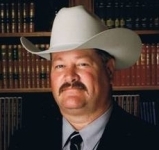 As sheriff of Hood County, I bring an extensive experience in Law Enforcement, fire, EMS and emergency services along with a high standard of morals, values, ethics and faith. I began visiting Hood County in 1979, moving here full time in 1987. Shortly after, I began serving the county as a volunteer fireman and EMT until getting involved in law enforcement in 1998. That same year, I served as Fire Chief for Indian Harbor VFD and volunteered for the Hood County Fire Marshal. All those years, I remained involved in EMS and in 2003, became the first paid Fire Marshal of Hood County until the end of 2008. I am trained in many emergency services and have over 2,500 hours of Law Enforcement specialized training qualifying me as a Master Peace Officer. On January 1, 2009 I was sworn in as Sheriff of Hood County. I have been on many boards throughout the years and currently active with the Children's Advocacy Center, Committee on Aging (Senior Center) and a member of the Emergency Preparedness Planning Council at the North Central Council of Governments. I consider it a privilege to serve as Sheriff of Hood County and in unity and cooperation with all county & state emergency services, will move Hood County safely into the future.